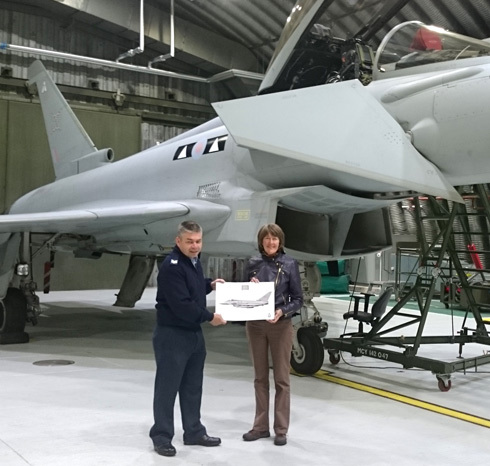 Sgt Stuart Smylie, presenting me with a print of the Typhoon behind me, signed by crew of II (AC) Squadron. decades ago. 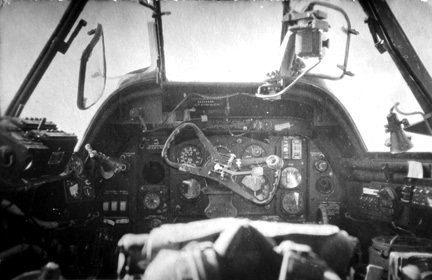 At first, it seemed to me that all had changed and the old planes were unrecogniseable in the new, but beside the computer screen displays in the Typhoons, you open a tiny flap to discover three small instruments dials, by which the pilot can bring the plane home if the computer system should fail. The glass screen that displays green-lit information between the pilot and the bubble of the cockpit canopy are showing him the old instrument information in a different visual format, generated by computer, but still the same information, albeit with loads of other stuff available at whim. One thing has not changed in all the years: the RAF family here – and elsewhere – has made me feel I belong, even though I know that belonging is because of my dear father, because of those years he served in the 1940s, and for whom it really was a family in more than just name. The Spirit of Coltishall Association is an aptly-named group of people whose aim is to keep alive just that. 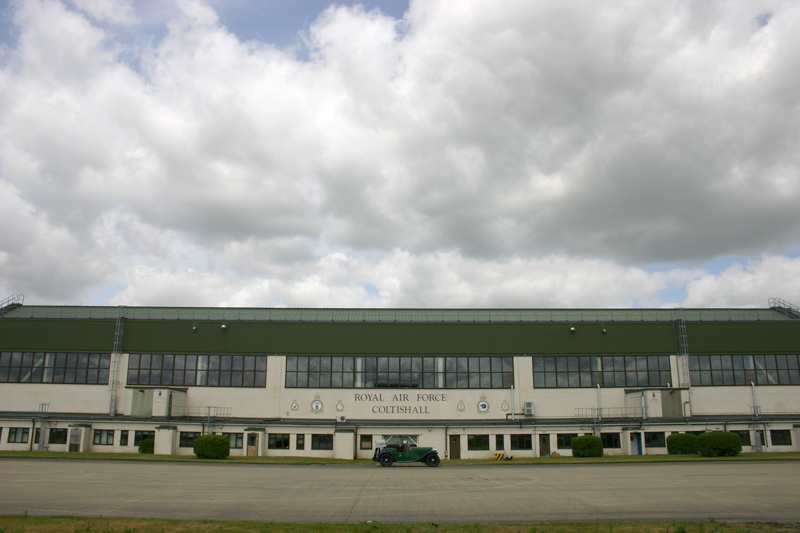 Having served at the RAF airfield, they consider it to have been one of the friendliest stations they experienced in their various RAF careers, something with which my father would have concurred. Though he was only there for a number of weeks, the name ‘Coltishall’ was quite familiar to us, but we couldn’t think why. Having visited and met these lovely people, and seen the site, I am beginning to understand that ‘the spirit of Coltishall’ is indeed a happy one. The place is remembered with affection and pride, and now that it has been sold off, this small group of enthusiasts represents an unofficial guardian of the site and the memory of those who served here. And it is a special site. It was finally vacated three years ago, and is now in the care of the borough and county councils, but its future is being decided carefully and gradually, and the Spirit of Colishall Association are consulted at every stage. The wartime hangars, control tower, runways, officers and sergeants mess – in fact a whole siteful of buildings – are all intact. 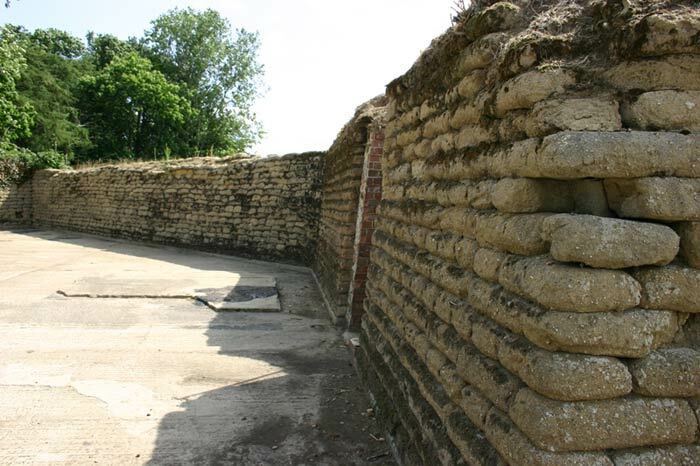 Especially impressive is the existence of wartime revetments, or aircraft dispersal bays. These were where the aircraft were scattered around the site in concrete enclosures, cleverly placed so that enemy aircraft could not hit more than one in a single run. 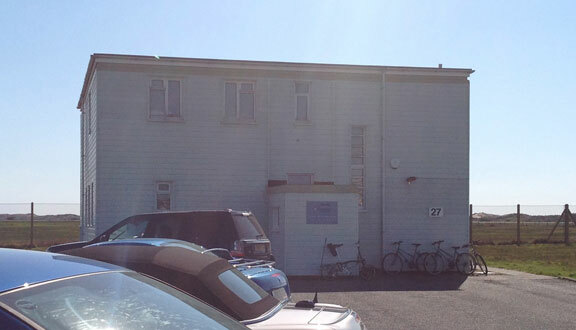 Two aircraft would have been parked here in back-to-back double bays, with their own air raid shelter and a dispersal hut where airmen would lounge around ready to scramble. Discarded tea cups have been found in the ground here, dropped when the call came. The walls of the bays are remarkable. They made me think of the walls of Machu Pichu, as their stones are rounded and fit closely, curving into one another. 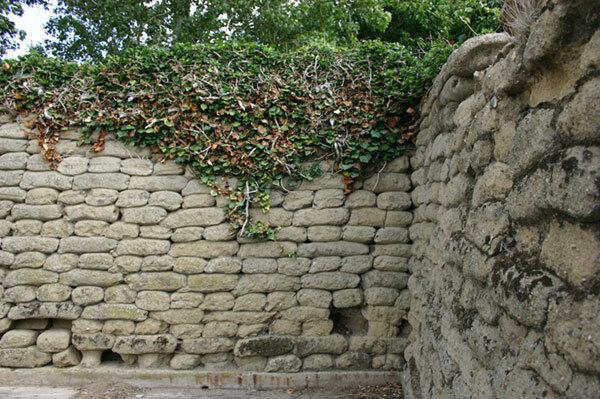 These are not stones, however, but sandbags mixed with concrete, that set into each other to form this beautiful wall. I am very glad that the Spirit of Colishall Association is here to guard them for the future. It’s a real shame that my version of the group photograph at Great Gransden airfield, at the Cambridge Gliding Centre, have not come out. I’ll have to wait until I get home next weekend and can download the pictures from my old digital SLR. 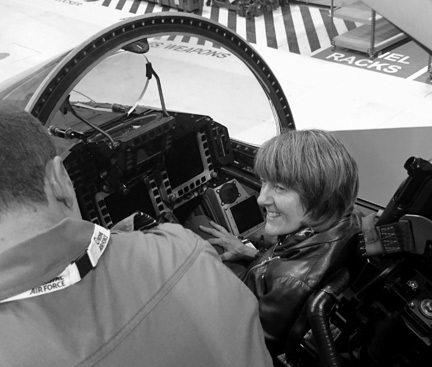 It’s a shame because I had the chance of a lifetime (for me, anyway) to go up in a glider. What a fantastic day for it. The horizon was clear from edge to edge when we first started. The land here is flat so it was like being over an ocean of land. We were towed up by Chris (thank you, Chris); the glider lifts gently before the towing aircraft leaves the ground. I’m in a Perspex bubble, in a comfortable seat at the front, so the view is spread out all around me, and my pilot, Andrew Watson, talks me through what is happening, what he is doing to catch the thermals below the clouds, and what are the different landmarks we can see dropping away below us. The towing plane departs and suddenly the speed drops, with the noise of wind against the canopy, and it is very calm up here, under the clouds as they sail past just over our heads. We climb to 3,000 feet. The land is far below us. I find it difficult to relate to it up here. The fine detail has gone and it’s the land itself that we see stretched out like a drum skin over the world. Andrew offers me the controls but as he demonstrates and the glider dips and moves I feel a bit queasy, a legacy of some ear problems left over from a flu virus back in January, so sadly I passed on this one one for now. As we circled back towards the airfield, and the houses came back into view amidst the outline of Great Gransden village (a car ambling along a country lane like a little ant) I thought of my father and his four visits here, making this same circling approach in 1944, seeing the same view, the same villages, those far horizons encircling his vision – our vision – and rushing down towards the awaiting grass. And, not for the first or last time, I wonder what on earth he would have thought if he’d known that I would be here now; after 70 years, in his air space. Note, this is taken from my working spreadsheet. I am still waiting to hear back from Cranfield. It’s quite a feeling to drive up towards the flat horizon, knowing that beyond the little village of Valley is the airfield where Dad first flew as a night-fighter pilot in 1941 (456 Squadron). I wondered which of the older little terraced houses might be the one where a lady made a bit of extra cash by serving home-cured ham and fresh eggs in her front room, which Dad and his friends used to frequent. They kept it as secret as they could from the rest of the Squadron. It was quite a feeling to drive through the Station and then for Chattie to be lined up with a Hawk jet for our official photograph. As I shook hands with Station Commander Group Captain Peter Cracroft I couldn’t help picturing my Dad’s amazed reaction if he could have known that this would be happening. He was always proud of serving at Valley. The Station Commander told me that the highest risk at the Station was still that of vehicles straying onto the runway. Seventy-four years after Dad hit that stray cook-wagon while trying to land at 110 miles an hour, it seems that potential hazard has not changed! The lovely Cerys, who supports my efforts from the RAF Benevolent Fund, had flown up from Cardiff in the morning; my thanks go to her, and to Darren at RAF Valley who escorted and guided us throughout our stay. After leaving the Station, and I said goodbye to them both at the ‘spotters’ car park’ nearby, a jet thundered by right over our heads. ‘I would like to say I had arranged that for you!’ said Darren. From that car park, I sat a little while looking over the airfield. From here, in a way, it is easier to get a feel for it as it was in 1941. Just the grass between the runways, and a few older hangars and airforce buildings over to the right. In front of me, Darren had pointed out a red light in the grass, where the perimeter track turns in towards the live runways. ‘That is the same system your Dad would have known – that is what the cook wagon ignored when your father was landing his Defiant.’ A strange feeling to finish with, contemplating that red light nestling in the grass, and thinking how close a shave it was that day for my Dad when he crash-landed on the one remaining oleo leg and finished up in the dunes beyond my line of sight. If he had been only 11 feet off the ground when he hit the cook wagon, instead of 12 feet, he would probably not have survived. 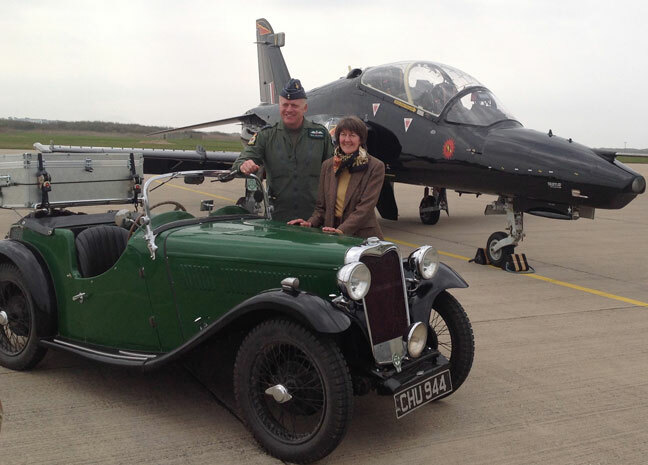 Then I wouldn’t have been here to visit RAF Valley in a 1935 Singer Le Mans, that’s for sure. 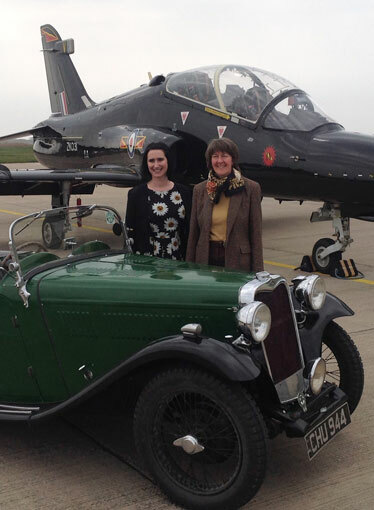 With a little help from various friends, including Graham and Amanda of GA Promotions (Militaria Fairs). I think I have now identified Dad’s ‘mystery’ airfield. On his list, I picked out the 60 UK airfields where he landed during the war, all except ‘Uppingdon’. There were several contenders for this, including ‘Uppingham’ north of London, suggested by several people. 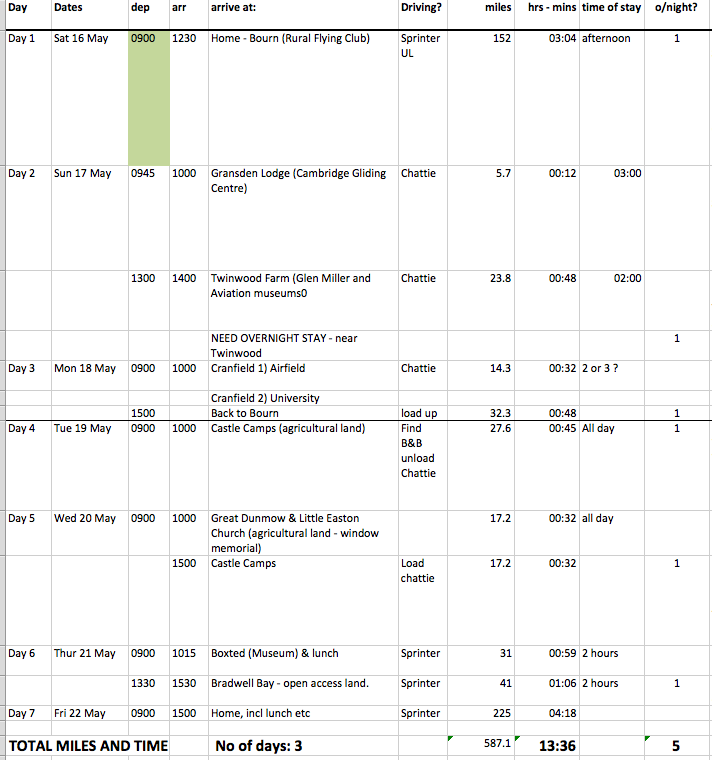 But this didn’t open until 1943, and it’s pretty clear (because he listed them in chronological order) that Dad’s visit to ‘Uppingdon’ took place in 1941-2. It was in the list next to RAF Shawbury and RAF High Ercall, so I identified the nearby village of Uppington as a possibility. 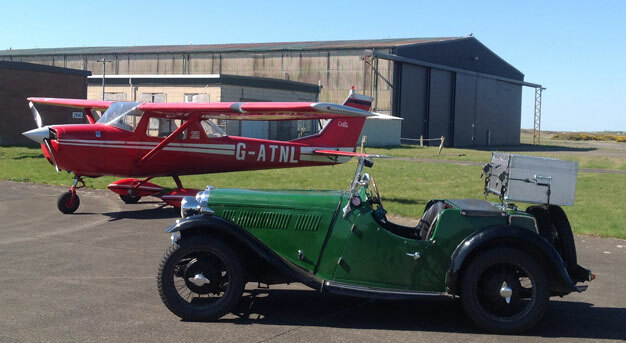 But…no airfield at Uppington. However, RAF Atcham, also a US air base at one stage, was in the same parish district, only a few miles away from Uppington village. My father wrote his airfields list neatly in the back of his log book at the end of the war, and he might well have known the airfield by the name of Uppingdon/Uppington as well as RAF Atcham. Besides, what more natural that in recording a single stop-off at Atcham, he remembered it by an evening in the pub at nearby Uppington?